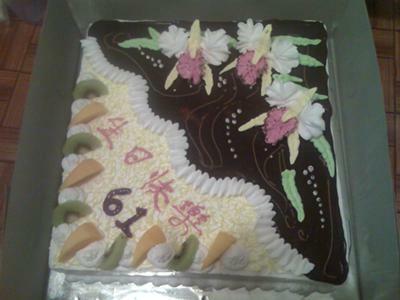 This was made for a friend who was celebrating his 61st birthday. The filling was chocolate sponge cake and topping with freshcream frosting and chocolate glace icing. The beautiful Borneo Orchids were the center of attraction. Happing viewing. My grandmother would have LOVED it, orchids were her favorite flower!